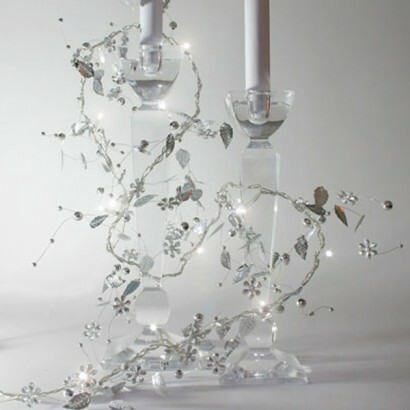 These Silver Whisper Stringlights are really pretty and delicate. The Clear and Silver cable has a range of Silver Pearl beads of varying sizes, little laser cut silver leaves, and crystal flowers, it really is truly stunning. Being battery operated and fully portable these would make attractive table centres or could be woven around other items. A very decorative light string suitable for any decor theme as Silver is a very neutral colour, and can look stunning regardless of whether its a Wedding or a Christmas.